Is the Apple iPhone 4S Boring? This normally happens to me … after a month or so after a new mobile phone release, I start to question if the manufacturer has done enough. We all know that many expected Apple to announce the iPhone 5, but that is old news now. I have learned to live with the fact that the iPhone 4S might well be my daily mobile for the next year. Of course there are many things I am happy with, but at the same time there is so much more that tempts me to ditch it. The Good Dealing with all the positives first … this is the easy bit. The camera is amazing, it allows some superb photos that look like they were taken with an advanced compact. Then we have the speed increase, which whilst minimal is very welcome. You can especially notice it when recording video and then wanting to record again or take a photo, there are no long delays as before. To finish off the good, the design stayed the same. Yes, they could have changed it, but why try to fix something that isn't broken (apart from the antenna, but that is a whole story by itself). Apple seemed to be very lazy with this release. The screen size stayed the same, whilst competitors splash their latest models with 4-inch plus displays. Not only is the iPhone 4S dwarfed in size, but many other handsets have AMOLED displays, with eye popping colours. It used to be that the retina display on the iPhone was king… well that is not the case anymore. The aforementioned increase in speed was welcome, but take a look at some of the latest Google Android handsets and you get dual-core goodness, coupled with more RAM. They even add some icing and a cherry on top by giving us expandable memory, which is something Apple will never do. OK, so it should have read "The Ugly" but iOS is not ugly at all. In it's latest incarnation, iOS 5 is super elegant (as it was before). Apple added some goodness with notifications, that pull down menu and of course Siri. I do feel very strongly that this was not enough. After the first couple of days I turned easy access to Siri off for security reasons. Apart from keeping my data safe, I also just grew tired of speaking to my mobile phone. The notifications are nice, but they are available on other mobile OS platforms, too. So I was back to using a new iPhone 4S which was all shiny and felt awesome, but still prodding away at the same icons as I had done for the past year and a half. 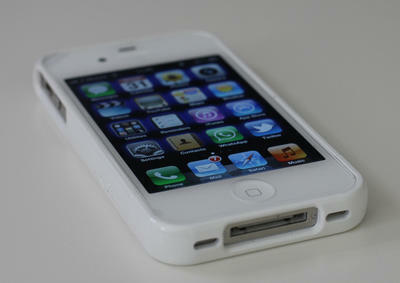 So even without any competitors, the lovely new white 4S was boring me. Looking over my shoulder the whole time, the likes of the Motorola Razr was very tempting. What really made me smile that same day was the announcement of the Galaxy Nexus, a beautiful looking handset, sporting the latest Ice Cream Sandwich (ICS) operating system. This offers up face unlock, voice typing, panoramic photos plus a whole host of new features. The hardware is superbly specced too, with a 4.65-inch 1280×720 resolution display, which is Super AMOLED, so will be sure to impress. The 5-megapixel camera is more than acceptable and it is all wrapped up in a nice sleek design. I will of course be reviewing the Galaxy Nexus and it may just tempt me away from the iPhone 4S. Will you be buying a Galaxy Nexus? What do you think of its features? Will you move away from iOS for ICS? Let us know in the comments below.